Maize is undoubtedly the most popular and common item on the Kenyan dinner table. Introduced by the Portuguese in the late 15th century, it quickly became popular among the locals. Within a short period it was being cultivated and consumed all over the country. So if you’re thinking of a low risk investment, setting up a maize mill in Kenya is probably the best move you’ll ever make. Maize is grown and consumed in varying amounts in almost all parts of the country. As the population continues to grow, so does the demand for its staple crop maize. 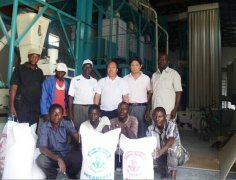 Choosing an appropriate site for setting up a maize mill in Kenya is therefore not very daunting task but there are some considerations you need to look at. One of the major challenges that you will face when setting up a maize mill in Kenya is space. You obviously want to put up the mill as close as you can to the target market. Finding ample space for both the raw material and equipment can be quite a challenge but certainly not impossible. You can either choose rented premises or purchase some land to put up your maize mill. As stated earlier, finding the market for your maize meal should be the least of your worries if you’re thinking of setting up a maize mill in Kenya. Virtually all wholesale shops, supermarkets and even the corner store stock maize flour. As long as you can ensure consistency of supply and quality, you are guaranteed to succeed. In addition to the regular consumer, you can also target learning institutions which almost invariably have Ugali on their menu. Correctional facilities and medical institutions can also be a rich market for your maize flour and you should try and land a lucrative tender to supply them. Before you commence your milling operations, ensure that you meet all regulatory requirements. Fortunately, the regulations for setting up a maize mill in Kenya are not very stringent. As you set up your mill, You may also consider an insurance cover and preferably one that covers personal injury to employees as long as other losses. Branded products will only be accepted in most supermarkets if they have the Kenya bureau of standards (KEBS) logo to assure customers of the product quality.